A total of 43 guests gathered at The Old Lodge, Minchinhampton, Nr Stroud, for a very enjoyable lunch on Wednesday 25 April 2018. The venue was recommended by Nick Hall (K1962-67) and it was perfect for the occasion. Set in the heart of Minchinhampton Common the restaurant had unrivalled views of the Cotswolds, overlooking the five valleys. The party started at 12 noon with drinks on arrival, and an hour to meet together, for some it was for the first time in many years. 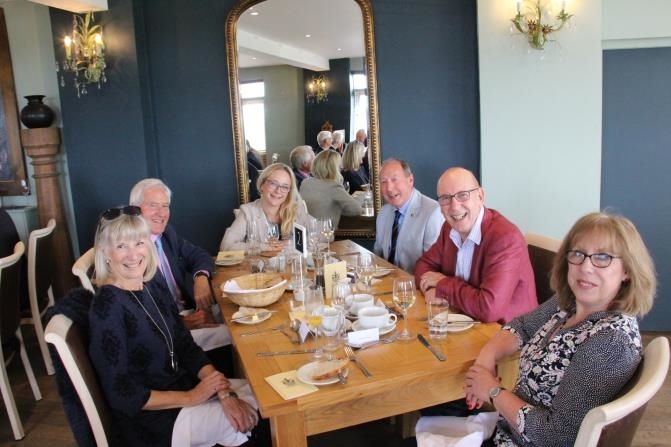 A tasty three course lunch was accompanied by much laughter and interaction between friends, sharing memories and personal stories. The Headmaster addressed the crowd and updated them on life at Aldenham today. He gave a clear picture of how the School continues to thrive and provide an environment that the current students obviously enjoy. The success stories he shared included an historical victory, by the Under 15 football team, of winning the Independent Schools Football Association Cup in March '18, the golf team playing in the Independent Schools Golf Association Matchplay final in April and a recent weekend when Sixth Form students cared for and entertained a group of severely disabled children, very ably and with great empathy. He highlighted the excellent outcome of the latest ISI Inspection, which took place in December '17 and also a report in the Good Schools Guide, which describes our current pupils as among the happiest they have met. After lunch there was still more convivial chatter before most guests departed and some prepared for an overnight stay at the venue, with no doubt more reminiscing throughout the afternoon and over breakfast.